What makes a good protest? Your voice does! 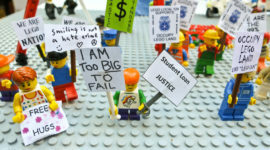 Come and share your voice, your opinion and your creativity at the Centre of Democracy’s Protest Lab. Join in the fun of the 2019 Dream Big Festival Big Family Weekend by making a placard, a protest poster, a campaign slogan, a badge and more. Bring your opinions and we will bring the rest. Suitable for all ages. Bookings not required.